Deciding to upgrade your home and get more on trend is exciting. As trends change, you may want to keep up with the times. This can mean changes inside and outside your home. Some of the most important parts of your home that make it trendy include the kitchen, the bathroom, the landscaping, the outside, and the flooring. So, this is where your renovation should start. This will give you the trendy look you are striving for in the design. You may want to renovate to increase the value of your home, so you can sell it. Or, you may just want a new feeling to the home you love. Whatever the case, redoing parts of your home can make it feel new, open and lively. If you want to instantly get on trend in your bathroom, you need to do a remodel. You can do a full remodel, where you tear everything out and start over. This will allow you to move the placement of the shower, toilet, or sink. However, this can be costly. On the other hand, there are things you can do without having to rip everything out. You can replace all the fixtures, this will give it an immediate update. Keep everything where it is, just update them. So, keep the sink where it is, but get a new sink and cabinet. Upgrading the toilet gives the bathroom a new look. 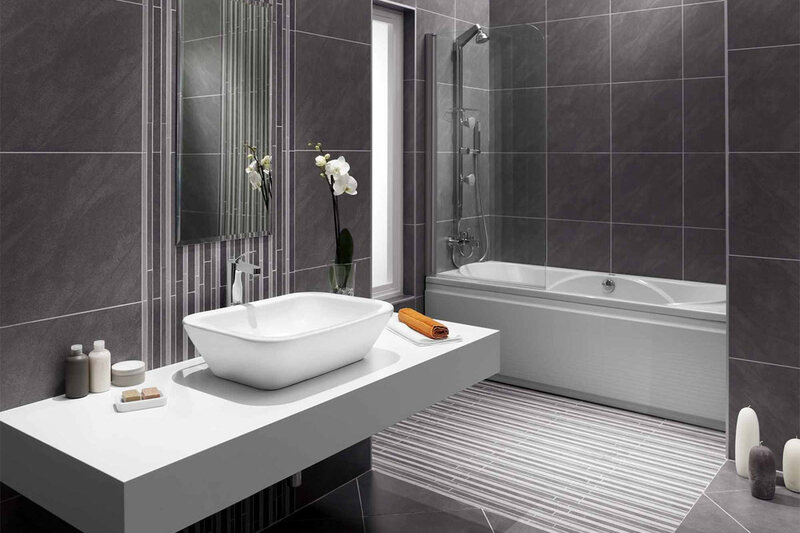 You can upgrade the mirrors and add some modern tiles to the floor or shower. To get that upgraded feeling, you want the bathroom to feel light and airy, with a spa feeling. Much of this can come with swapping out the old for the new, without moving anything and replacing curtains, towels, and shower curtains. As with the bathroom, you can choose the costly and time-consuming route of a full remodel. This may give you the kitchen of your dreams, but it will come with a cost. Conversely, you can change some things in your current kitchen which will give it an instantaneous updated and trendy feeling. Changing the hardware will have a dramatic impact on the look of the kitchen. Getting a new sink can give a sense of openness because you can get a large, deep sink that is more conducive to your needs. Additionally, a coat of paint on the walls and even the cabinets can transform the kitchen. And, even if you leave all the plumbing where it is currently located, you may be able to change the island. Another way to make a big impact is changing out the counters and choosing something that will give a bright environment. These changes will be on trend without having to completely rip out the kitchen. Flooring can create fluidity and movement throughout your home. Having consistent flooring can help make the home feel cohesive. There are many options available when deciding to redo your floors. You need to decide if you want carpeting in some areas or hardwood everywhere. Hardwood floors seem to be the trend, so either installing or refinishing hardwood floors can give your house a trendy feel. Depending on the condition of the floors, you may be able to strip them down, sand them, and refinish them. However, there are many options for replacement available. You can get a tile that looks like hardwood and you can get actual hardwood flooring. Using flooring to complete the look you are going for is a great undertaking, but when it is finished it updates your entire home. Transforming your landscaping outside will transform your curb appeal and your home. You can become the house everyone looks at for ideas to incorporate into their own landscaping. It is important to have a plan when you are deciding to update the landscaping. It is important to know where everything is going and how you are going to make it cohesive. You can use hardscaping and landscaping to make an interesting, appealing design. During planning, special care should be made to eliminate any safety concerns, like awkwardly placed rocks or retaining walls. You do not want to overwhelm your home with too many ideas at the same time. The landscaping should complement your home and make it a place you want to spend time and relax. Maybe you have a few spots that need to be fixed, or maybe you want to get a whole new look to the outside of your home. Changing the color of your home can give it an instant upgraded, trendy feeling. Get rid of the old dingy colors of the 1990s and embrace the newer, cooler colors of today’s market. Depending on what the outside of your home is made of will determine what you can do with it. Of course, you can always rip everything off and start over, but you might not have to do that. If your house has siding, and you want a different color, you will probably have to take it off and put the new color on. However, if you have stucco or some other paintable surface on the outside of your house, you have a choice. You can choose to put siding over it, or you can paint it. Choosing a paint color is important because it will be on the entire house. Pick a few colors and see how it looks with your house. Getting a professional for exterior painting is probably the best route to take since it takes a lot of preparation and skill. However, when you are done, you might not even recognize your own home. Renovating your home may take some time and money, but in the end, most homeowners are happy they did it. It makes their home feel new and fresh. You can put your own personal touch on it, so you can enjoy all the time you spend there. So, get to renovating so you can show it off to your family and friends.